Feasts are at the very centre of our best and most dearly-held memories. Christmas or Hanukah or other important festivals with all those traditions: the same dishes on the table, the best foods of the season, Grandmother’s crockery, and tales of past feasts. My Family Feast – A world of family recipes and traditions invites us into the homes of folks who hail from across the globe. They are now building new lives in another land and perhaps that’s the reason they cling to those memorable meals cooked in their respective countries of origin. Those homes are filled with the delicious scents of cooking, from Afghanistan to Vietnam. Recipes from India to Italy are replicated and shared. For many of us, food is not just about nourishment but conviviality and this book has heaps of both, garnished with diverse cultural overtones. This is family cooking, and simple and hearty fare. Each chapter has its focus on an individual family; we hear their stories of fortitude and flight, and then it’s on to the food. The recipes here are simple. They have been handed down through generations of home cooks. Nothing too cheffy: hardworking families don’t hire a chap in a toque and white jacket when they want to lay on a spread for their loved ones. It’s a solid international cookbook with something for every taste. Snacks, main courses and sweet treats are all listed. Ljevaca is a baked dish of courgettes, cottage cheese and polenta. Perfect for a lunch or a snack. An economic recipe that will serve a family of six for very little money. This is a Serbian speciality that needs hardly any preparation. It takes 40 minutes or so to bake but you don’t have to hold its hand while it cooks. There is always room for dessert, and Greece has Loukoumades. These are the famous honey-drenched delights much beloved by all those with a sweet tooth. An ideal end to a meal of 12kg of lamb. Yes, I did say that the recipes are simple, but there are one or two that are designed to feed a dozen or so guests. An Iraqi feast might present diners with Chicken Biryani. This is another dish that stretches the pennies. 2kg of chicken can feed 10 people. Rice and pasta are used as the filler along with vegetables and dried fruit. This could be a regular big-family favourite, and a huge bowl is a spectacular dinner party centre-piece. Entertaining on a budget. I am always tempted by Indian sweetshops. Those pastel-coloured pyramids of burfi are almost impossible to pass by. Naru are caramel and coconut balls and making them at home will save a trip to your nearest Asian neighbourhood. They can be made in your very own kitchen, with just desiccated coconut, brown sugar and ghee to be added to your usual shopping list. The recipe makes 30 – 40 balls and that’s easily enough for 2 people chez nous. 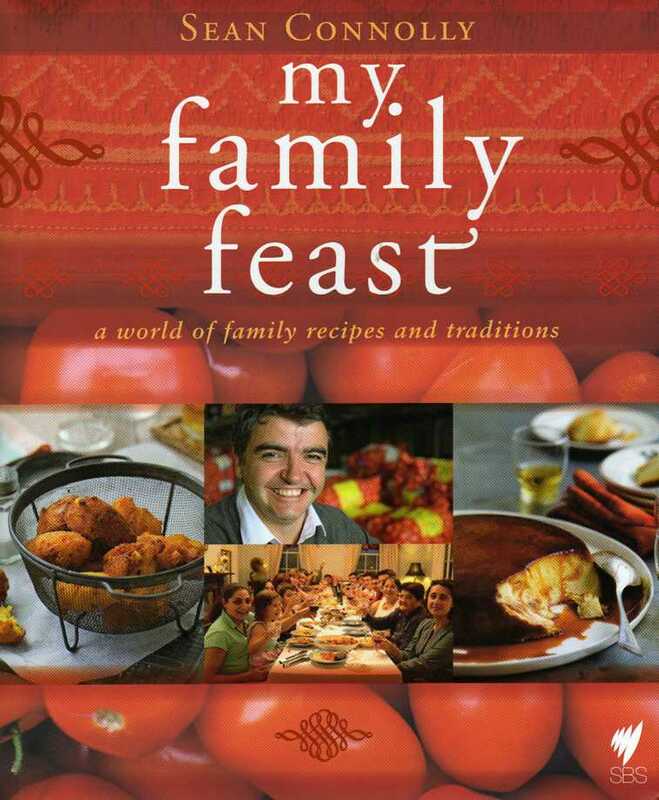 My Family Feast – A world of family recipes and traditions is a charming book. The dishes are not extravagant but they are important to each of these families who have shared their food memories. You will have your own special recipes and your own traditions but these new ones will at least add to your culinary repertoire in the most delicious fashion.